Mather in his journal described the storm that stuck the James. 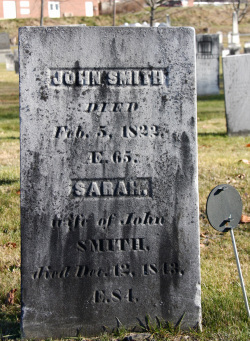 John Smith stood on Lexington Common on the morning of April 19, 1775 along with the few other members of Captain John Parker’s militia company who had hastily responded to the urgent beat of William Diamond’s drum. Presumably, John also joined with Captain Parker to ambush the Regulars on their return from Concord at the site in Minute Man National Historic Park known as Parker’s Revenge. 2Charles Edward Banks, The Planters of the Commonwealth: A Study of the Emigrants and Emigration in Colonial Times: to which are Added Lists of Passengers to Boston and to the Bay Colony; the Ships which Brought Them; Their English Homes, and the Places of Their Settlement in Massachusetts, 1620-1640, Houghton Mifflin, Boston, 1930. 7Hudson, Volume II-Genealogies, p. 630; Fred G. Barker, Watertown, Massachusetts, Records of Births, Deaths, and Marriages, 1630-1693, Historical Society of Watertown, MA, 1894; Henry Bond, Genealogies of the Families and Descendants of the Early Settlers of Watertown, Massachusetts, Little, Brown & Company, Boston, 1855. 8Francis H. Brown, M.D., A Copy of Epitaphs in The Old Burying Ground of Lexington, Massachusetts, The Lexington Historical Society, Lexington, MA, 1905, p. 141; Joseph’s brother Thomas and wife Mary Hosmer Smith are also buried in The Old Burying Ground, ibid., p. 142. 9Hudson, Volume II-Genealogies, pp. 631, 635; Lexington, Mass., Vital Records of Lexington, Massachusetts through 1898, Births, Marriages and Deaths, Wright and Potter Printing Company, Boston, Mass., 1898; New England Historical and Genealogical Society, Vital Records of Newton, Massachusetts to the Year 1850, Boston, Mass., 1905. 10 Massachusetts Office of the Secretary of State, Massachusetts Soldiers and Sailors of the Revolutionary War, A Compilation from the Archives, Seventeen volumes, Wright and Potter Printing Company, Boston, 1896, vol. 14, pp. 444, 446. 12Assessments and Tax lists, Town of Lexington 1784-1789, CD at Assessors Office, Lexington, MA. 13Franklin P. Rice, ed., Vital Records of Winchendon, Massachusetts, to the End of the Year 1849, F.H. Gilson Company, 1909. 14The following information from gravestone markers and records courtesy of Bill DeFlorio of Randolph, VT. John and Sarah’s nine children were: 1. Sally, b. September 7. 1782 Winchendon, MA, place of death unknown; 2. Anna, b. September 27, 1784, place of birth unknown; 3. Esther, b. March 25, 1787 Winchendon, MA, m. Nathan Blood Shattuck May 22, 1823 Mason, Hillsborough, NH, d. Ashby, MA March 28, 1861; 4. “Deacon” John, b. October 25, 1789, Randolph, VT, d October 8, 1828 Randolph, VT; 5. Levi, b. October 5, 1791, Randolph, VT, d. October 8, 1828, Randolph, VT; 6. Lucy, b. June 18, 1794, Randolph, VT, d. January 6, 1819, Randolph, VT; 7. Bezaleel, b. April 2, 1797 West Randolph, VT, d. May 15, 1879 West Randolph, VT; 8. Hiram, b. October 11, 1799, Randolph, VT, living Randolph 1880 age 80; and 9. Maria, b. October 17, 1802, d. July 8, 1878, Randolph, VT.